A few years ago we posted a story about “yarn bombers” in the US making scarves and leaving them hanging from trees in the park for anyone who needed warmth. The article, with photo of a snowy park with trees and scarves, sparked an idea for Cris Clucas, who works at a university in Canberra, the capital of Australia. In July it is winter ‘down under’, but many international students arrive from the Northern Hemisphere, where they leave their summer behind to discover a very cold climate. Cris’s idea was for students, staff and professors to get together, which she says normally “never happens,” to knit scarves and hats to give to new students as a welcome gift. 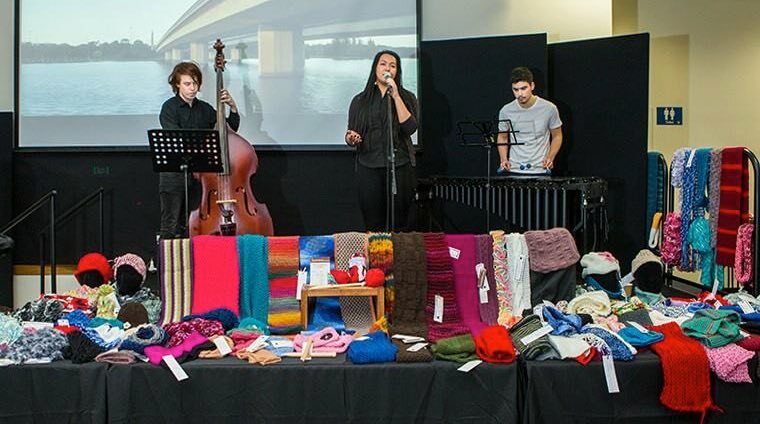 After media coverage, the project at Australian National University spread to involve members of the Canberra community; people from “all over” donated yarn and sent messages of support. The group is doing it again this year for the second time and Cris is headed to a conference to report on the project as an example of how to create community across boundaries and help new students to feel belonging in the community. “Thank you for being the inspiration—from across the world—for this project,” she wrote in an email, realizing that ‘community’ now extends way beyond international borders, thanks to the internet.